View our entire line of equipment & supplies! This high solids tinted concrete coating is a professional grade sealer that has been a work horse for over 35 years. Used with STARDEK I, Stardust, and Riviera. 40 colors available or you can mix any custom color to meet your fancy. Polymer made by STARDEK as a cement admixture . Proven over 35 years to provide the ultimate strength & adhesive. For use with Grout mix, Texture mix, & Super fill. Colors available are Buff, Black, Blue, Brick Red, Brown, Tan, Terra Cotta, White and Yellow. These are the highest grade concentrate color available in the industry today! Used to color STARDEK II & III and used in color wipe formulas. Used to slow down curing process in STARDEK I, II & III as well as Ashdek. 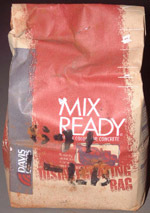 Grout mix - Comes in 36 lb. bag. Why trowel base your coat when you easily spray STARDEK grout mix? 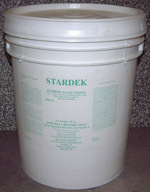 STARDEK’S Grout mixes are acrylic modified cementitious material used in the STARDEK I,II, and III application processes. Texture Mix - Comes in 50 lb. bag. STARDEK’S Texture mixes are acrylic modified cementitious material used in the STARDEK I,II, and III application processes. When combined with STARDEK Resin they produce an excellent multipurpose decorative floor coating system. Super Fill - Comes in 50 lb. bag. Modified cement, used to fill in voids with depths up to 2 inches in one application and can be feathered edged to make nearly any repair. To be mixed with STARDEK II Resin. This quick drying crack filler is extremely hard. Used on bridges & roads to minimize the risk of cracks re-appearing in the substrate. Using Overlay primer as your first coat, this self leveling cement is great for re-finishing rough or uneven interior floors. Just add water! High quality premium clear sealer used for STARDEK II, STARDEK III and Stamped Overlay, as well as many other applications. Superb performance over the last 35 years. Part of STARDEK’S “Green” product line. This sealer has been available for many years demonstrating outstanding durability and longevity. For STARDEK I, II and Stamped surfaces. Meets all VOC standards. 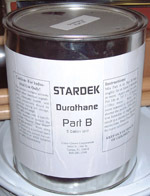 Primer used specifically for STARDEK overlay systems. An Industry Icon, this material is a polymer specifically manufactured for stamped and wall overlay applications. Supplied as a concentrate so you can dilute 1 part modifier to 2 parts water. 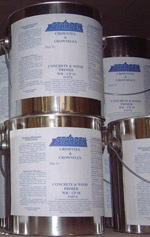 Color pack used to color STARDEK overlay floor or wall mixes. Colors available in : Brick Red, Cobble Stone, Flagstone Brown, Graphite Black, Harvest Gold, Mesa Buff, Mesquite, Pewter, Sandstone and Slate Green. 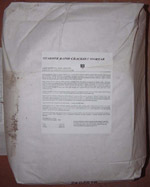 Specifically formulated cement mixture for stamped overlay applications. This dry mix is added to Overlay Modifier for extreme durability. Available in both standard gray and porcelain (white). Used in many STARDEK and stamped concrete applications available in 5 colors: Autumn Brown, Charcoal Gray, Desert Sand, Platinum Gray, Terra Cotta and Slate Green. Specifically formulated cement mixture for stamped or carved wall applications. Can be applied over drywall, wood, concrete or just about any surface. This dry mix is added to Overlay Modifier for extreme durability. Available in both standard gray and porcelain (white). This product is used for stamps, mats, and texture rollers to keep cement from adhering to your tools. Highest quality vinyl chips for the popular StarChip coating system. Extremely durable & long lasting, will not shrink or fade. 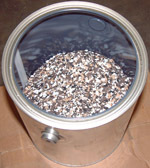 Tinted epoxy used for the StarChip application. Broadcast StarChips into this material and seal. Also great for solid applications. 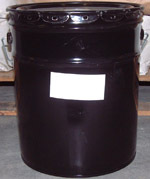 Used to acid stain concrete areas for various designs and patterns sold in 1 gallon containers. Available in: Bluestone, Gibralter, Medallion, Nightfall, Rainforest, Tropicana, Turtleneck and Wolverine. A 2 part crosslinking epoxy primer used to prime area of application before CrownFlex or Tex is applied. A single component rubberized polyurethane that can be applied over wood, concrete, metal and fiberglass. A unique sealer formulated specifically for pavers and bare concrete. 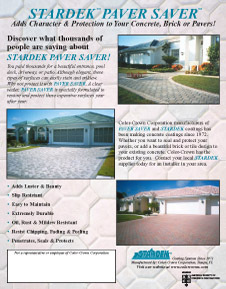 Available for decades, it is the ultimate protective coating for expensive pavers, or for just sealing bare concrete. Specifically formulated acid gel used for specific applications when liquid acid isn’t appropriate. High grade degreaser used to remove grease from concrete. This is a “must”. 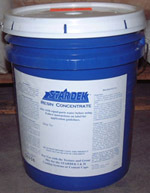 Used to provide a non-skid surface in multiple STARDEK applications. Available in both clear and buff color. This heavy duty jumbo roller frame is built to last job after job. It is designed to fit STARDEK’S jumbo roller covers. High quality roller covers specifically made for Stardek materials. Why fumble with measuring tapes! This exclusive tape has excellent adhesion properties and makes applying measured patterns a snap! Used to mask off a variety of different applications. Sold in individual rolls or by the case. Sizes available in : 1/2", 3/4", 1", 1 1/2", 2". Paper for protecting painted walls and other surfaces. Saves time on clean-up. Used to apply tape and masking paper during preparation stage. Makes masking a breeze! Used in preparation stage to protect house, flowers, and walls from overspray. This durable heat gun is used to dry concrete and cementitious materials. 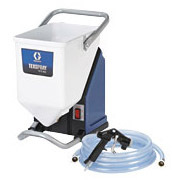 Valuable tool used to smooth small areas of rough concrete or cementitious coatings. Used to Chisel off any concrete imperfections that need to be removed. This utility tool is a must have on any job. This special gun is designed to apply a two cartridge system. Used for 2 part Epoxies and STARDEK’S crackset. Highest quality concrete tool for edging wet cementitious products. A durable tool for concrete finishing. Well designed specially shaped deck trowel. Used to tamp down stamps during stamped overlay applications. Accurate measuring device to quickly figure job square footage. No more clumsy tape measures and looks more professional. An industry standard for applying cement or epoxy to a uniform depth. Used for extending Grout pattern lines beyond the edge of mats or stamps. Sizes available in : 1/4" Flat, 1/4" Round, 3/8" Flat and 3/8" Sanded. 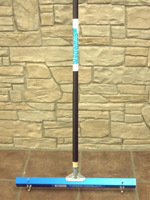 This unique tool is made for carving grout lines in both stamped overlay & wall overlay systems. These shoes are used in STARDEK III applications to maintain pattern while walking on surface. Sturdy roller for applying texture patterns to fresh cement or STARDEK III cementitious coatings. 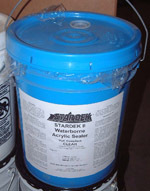 Used to apply a stone or slate texture to STARDEK III or Overlay products. See stamp master catalog for different selections. Used in the crack chaser saw to grind a “V” in surface before making a repair. Used to grind out cracks or any imperfections on concrete. Used to spray acid stains and other corrosive materials. 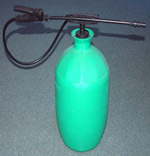 This chemical resistant sprayer is used to spray solvent based materials. This specially made gun is manufactured for STARDEK to apply the stardust material system. This important pressure washer tip is made to blast off loose paint and concrete. Circular light weight pressure washer attachment used to clean large amount of surface efficiently. Available in 2 sizes: 16" and 22"
3000 PSI, 11 HP Honda engine with a cat pump and non-marking hose. Used to clean and prep concrete before application. 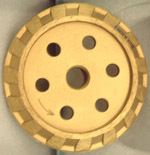 Uniquely designed blade made especially for STARDEK custom mixing drill, and drill stand. Used to blend dry powders. This commercial drill specifically designed to mix our cementitious and xylene based products before spraying. Great to hold mixer and bucket in place while mixing, also increases safety and decreases manpower. 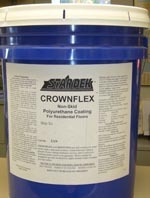 Used to spray cementitious and Crown Flex material onto a variety of surfaces. Used to spray StarChips onto concrete surface. This rugged compressor is used to drive the Tech Sprayer, the Stardust spray gun kit, as well as the Spraying Mantis. Just one compressor used for all your needs. This Tex Sprayer is used to spray all STARDEK cement mixes. Reduces spraying time by half as compared to hand held guns, and is less labor intense. A must have for any professional! 12 or 24 inch surface grinder used to grind and scarify a cement surface during the preparation stage. Enables you to get some jobs done the same day. Exclusive color charts for STARDEK decorative concrete products. Custom blending formulations included. This program allows you to take a picture of a prospective customer’s job and then with the use of a computer show your customer what it would look like once completed with STARDEK products.